This has become one of our most favorite meals; yes, it is tasty, but I also really appreciate how easy it is to throw this dinner together. In my home, I am infamous for finding ways to add vegetables to our diet, inconspicuously! Thus, things like shredded carrots and zucchini find themselves added to everything from marinara sauce to meatloaf. Until recently, Kate was not a huge fan of cauliflower, thus it was a vegetable I rarely made; but on a whim, I decided to add some fresh cauliflower to the skillet, after pan frying steaks, and much to my delight, she found it delicious! Yes, I will confess this is not a low fat meal, but it is quick and delicious; and open to many substitutes. We prefer our vegetables al dente, and our steaks medium rare; you will adjust cooking times to your taste. Heat a large skillet, add olive oil and two tablespoons of butter, add the steaks, which have been salted and peppered. 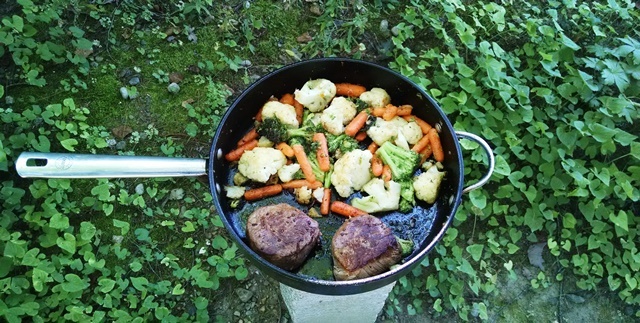 As you brown the steaks, add the vegetables, starting with the ones that take the longest to cook, in this case cauliflower, after a minute, the carrots, and then after another two minutest, the broccoli. Turn the steaks over, and tip the skillet so the pan juices spread into the vegetable melody. Add garlic powder to the steaks, as well as a pad of butter on top of each; additional salt and pepper to the vegetables, and a couple more teaspoons of butter over the vegetables. If so desired, you can put a lid on the pan, with the stove off, to finish cooking. This entry was posted on September 27, 2018 at 12:00 am and is filed under Food, SlideShow, Uncategorized. You can follow any responses to this entry through the RSS 2.0 feed.